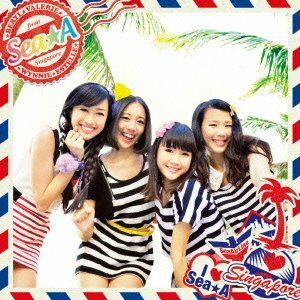 Sea☆A’s name is short for South East Asia ☆ Anime. 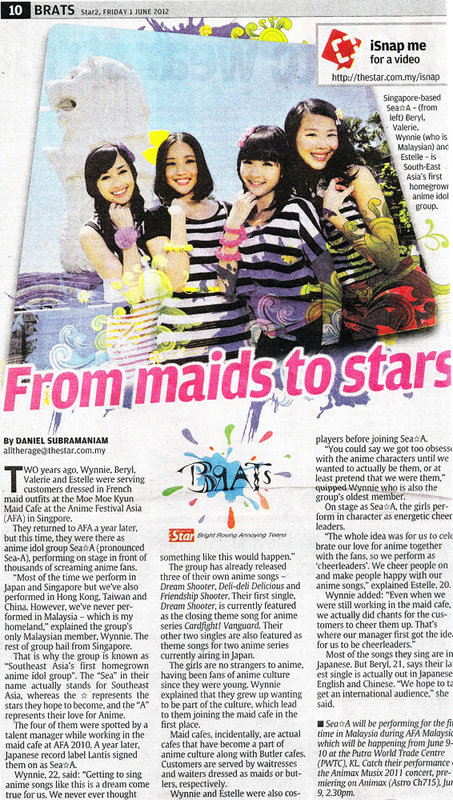 Since all members are from South East Asia, “SEA” was chosen. The “☆” represents the stars that they want to be. The last “A” represents the their passion for Japanese anime and the wish to spread their songs throughout Asia with their activities. Anime Festival Asia (AFA) is an anime convention held annually in Singapore since 2008. The Moe Moe Kyun Cafe, which first debuted at AFA, features talents who love Japanese Anime, Idols, Cosplay, and Figures. 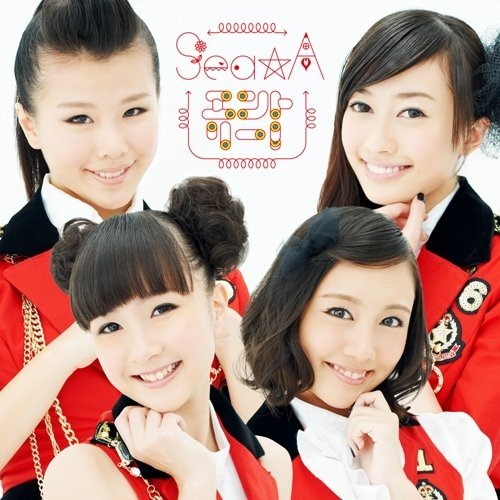 It is from those pool of talented individuals that 4 girls with strong personalities were chosen to for “Sea☆A”. Estelle (Singapore) is the most active person in the group and is also the youngest member. She has a transparent voice and a natural born talent for dancing, with soul and sharpness. Beryl (Singapore) although having the looks of an Asian beauty, is shy and modest. She is the hardest working member in the group and is reflected in her studies. Wynnie (Malaysia) is the moe, cosplaying member of the group. She insipries others with her innocent personality and natural cheerfulness, providing the best cheers and ” moeness” to everyone that she meets. Valerie (Singapore) has a brilliant figure but has therapeutic powers too! She has the beauty and a cute voice like that of anime characters. Together in their cheerleaders costumes, Sea☆A is all ready! Singing and dancing to their favourite anime songs, they hope to spread 100% Moe healing power and happiness to everyone around the world! Their first single, “Dream Shooter,” was featured as the third ending theme of the hit TV anime, Cardfight!! Vanguard. “Dream Shooter” was also selected by the AFA committee as the AFA 2011 theme song. Their next single, “DELI-DELI☆DELICIOUS”, was chosen as the ending theme of the Japanese anime Toriko. In November, 2011, the girls performed at the prestigious Animax Musix 2011, in Yokohama Arena, alongside prominent anime song artists May’n, Shoko Nakagawa and angela. Their third single, “Friendship Birthday -Arashi no Yoru ni-” is the opening theme of the animated TV series Arashi no Yoru ni -Himitsu no Tomodachi-” (“One Stormy Night – Secret Friends”). The “Friendship Birthday” single was recorded in three versions: Japanese, English, and Chinese. “Friendship Birthday’s” coupling track, “Shiawase♪Run Run Run” was used as a commercial theme for the anime short “Ribbon-chan” sponsored by Sapporo beverage Nori suta Max. Their fourth single “ENTRY!” is the new ED for Cardfight!! Vanguard.